If US medical lobbies hadn’t achieved regulatory capture by blocking off public access to prescription medications in the early 20th century, it’s likely that thousands of general internists would have been replaced by tools like WebMD, the same way travel agents have largely been replaced by Expedia. Being a general practitioner may still be a protected middleman position, but it’s becoming more fundamentally endangered all the time. For instance, now there’s a free app called OMNIO: The exact same symptom checker, drug interaction screener, and all-in-one reference guides that doctors use. Or rather, the same references guides that doctors are trained to use in school, but neglect to consult in practice with real patients. So unless you need access to prescription drugs that doctors have blocked you from getting, I recommend you seek higher quality, more comprehensive medical care using OMINO, instead of primitive, non-software doctors. Thanks for reminding me of a question I wanted to ask: what would the actual consequences be of removing the prescription system? Yeah, it would mostly just be better. I don’t believe that widespread, direct access to prescription medications would have a real downside. The reason I believe this is that many countries in Asia like Indonesia do have nearly complete access to any medications they want, and they don’t experience the downsides that Americans hypothesize would occur. Is that available on Android? In your view, Louie, how can physicians remain useful? Any recommendations for physicians in training? Honestly, for the past several years, I have analyzed my own symptoms, done some research, and presented the findings to my doctor, along with what would need to happen. Luckily my practitioner has been cooperative. I still consult him if I’m unsure or need a second opinion. I would consult him if something seems serious. No android version yet, but it will be there “soon”. I agree with the idea of making medicine freely available (it is just one aspect of the more general question of drug legalization), but at the same time, unrestricted access to antibiotics is actually a problem in Asia given that there’s a real public health impact in the form of antibiotic resistance. So I think *targeted* restrictions are still appropriate where there’s a specific reason for them, but the default should be unrestricted. Austin: Specialize. There’s still a need for doctors that treat burn victims, broken bones, heart attacks, strokes, etc. It’s doctors who simply prevent people from getting amoxicillin who don’t have a future. Antibiotic resistance is a problem in Asia? 1. After I give it symptoms A and B, does it ask me if I also have C, D etc. as my doctor does? 2. When I give it all my symptoms at once, does it try to find one condition that matches them all or does it ask questions to discern if some of the symptoms might relate to one condition, some to another and deems some as likely unimportant(as my doctor does)? 3. Does it give me probabilities for what is most likely that I have based on my symptoms (as my doctor kind of does) or does it give me cancer and tumours as one of the likely conditions on most searches (as other apps do)? 4. Does it recommend what blood/other tests I should do to find out more in cases when it might be needed to do so? I haven’t seen any apps that do those things properly, even though it should be possible to program one to do them. Your praise the app a lot in your review, so I am curious if it at least passes the above test. Louie Helm: Yes, it is. Example: http://www.ncbi.nlm.nih.gov/pmc/articles/PMC3783766/ which specifically cites inappropriate use of antimicrobial drugs as a contributing factor. Granted, antibiotic resistance is a global problem and a complex one with lots of confounding factors, but the evolution of antibiotic resistance, at least, is pretty well-established, as is the evidence that improper use of antibiotics speeds the emergence of resistant strains. Todorov, the application you’re asking for, I used to work on years ago, and never was released. The consumer market couldn’t bear the costs. Doctors found it competitive. Nurses aren’t allowed to diagnose. Alex, does this mean that the application in question (Omnio) does not do these things? Louie’s representation sure makes it sound like it is at least that good(as the 4 points are the first things off the top of my head that doctors do when diagnosing, while apps do not in my experience), and he is one of the few people who I’d normally not consider to be shilling for a friend, or being sensationalist, or whatever. That study cites 111 cases of MRSA in India. That’s sort of what I expected before opening it. In a world with scope-based priorities, no one would ever write or read that paper. Although I agree that decreased effectiveness of antibiotics over time is an issue, I disagree that it’s an urgent matter, that it’s worse in India than other places, or that restricting peoples’ access to antibiotics via doctors is the easiest or most promising way to address it. My basic attitude is that until a given country bans prophylactic use of antibiotics in livestock, don’t insult my ability to have sane values + detect scope by first talking to me about restricting use in humans. Omnio does not replace your GP. It’s yet-another-reference tool for doctors and med students, like Epocrates. The closest thing out there to what you’re looking for is called 5-minute Clinical Consult and I haven’t evaluated it in years, so maybe it does what you want by now. 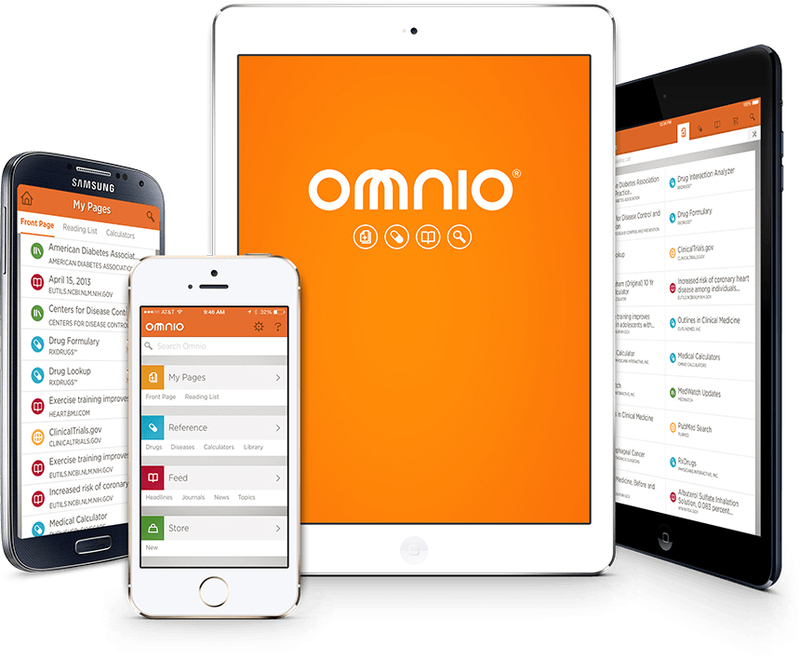 It’ll cost you $60 inside the Omnio store or $100 standalone to find out. I just checked the application out and I wasn’t that impressed. Are you talking about the symptom to disease portion of the diseases section? If so this is not that cool, for example the first symptom is abdominal ruq pain, for which I was expected a nice differential including gallstones, pancreatitis, et al, but all I got was a link to an overview of hepatitis. The app you described probably could be made, it’d be baller, and I’d welcome it, but unless I’m missing something this is not that app. I should note, I wasn’t that impressed with the symptom-to-disease portion, i.e. what would be useful for a typical patient. I was pretty impressed with the resources it has for doctors, who seem to be the main target for the app. If I have health insurance as part of my existing benefits (that I already pay for or that my employer pays for) and am suffering from something nasty enough that I actually have to go see a doctor for it, why wouldnt I just pony up the nominal amount of cash for a co-pay rather than having some app tell me what dosage of amoxicillin I need? It’s a baseline benefit that just about everybody with health insurance has, and I fail to see the argument for using an app unless you’re paying for your GP out of pocket and REALLY need that co-pay cash. Removing prescription barriers is a terrible idea imo, given both the massive scale of prescription drug abuse in this country and the rise of diseases like MRSA that are directly related to overuse of antibiotic. There’s a reason doctors dont like to prescribe penicillin specifically, and it’s got nothing to do with them being a medical cartel trying to keep their GP positions relevant. Societies like Indonesia are radically different from the US due to their ethnic and religious composition, as well as cultural values, and cannot be used as some example of why removing prescription barriers in THIS country would be awesome-sauce. My point in mentioning Indonesia is just to change the terms of the debate. I think people by default assume the status quo bias… that the burden of proof for whether something is a good idea should be on whoever wants to change it. I agree that in practice, people wanting to change things do have this burden… but people just wanting to know the right answer don’t need to do this. In other words, “It worked in country X” is enough evidence that you should privilege the view that “This would work in another country by default”. My contention is that because Indonesia does this and nothing bad happens, the burden is on defenders of the US’s status quo to explain what makes Americans so much stupider than Indonesians that they can’t handle this same right? Saying they have a different culture doesn’t seem like sufficient grounds on which to dismiss an entire country’s worth of evidence. Does Indonesia also have an ongoing pain killer epidemic?Does it have a robust trade in meth, oxy, etc and a 1000 mile border with a lawless country full of drug cartels? What are the penalties for drug smuggling in Indonesia vs. the US?What are the views of conservative muslims (the majority of Indonesians) on drug abuse? What does “nothing bad happens” mean? A total gun ban “works” in Japan, and beheadings “work” as a punishment in Saudi Arabia, it doesnt mean that those are features of Japanese and Saudi life we should import into this country. These are some interesting questions. But they’re the kinds of questions that without answers, don’t make an argument themselves. Simply raising the possibility that another country is different provides very little evidence. You would actually need an answer to one of your questions to hope to tip the balance of evidence into the status quo in the US being plausibly right. What I find crazy is even if you jump through all the hoops to get “the power of the pad” you’re not allowed to prescribe yourself anything. Not even eye drops or vitamins. Vitamins are completely unrestricted. You dont need a prescription to buy them. Oh really? Tried to get some IV B12 lately? What is “IV” B12?Regular B12 supplements are on the shelf. Intravenous formulation. There are plenty of things that have both a prescription strength version as well as an over the counter form. I know a dentist pharmacologist who was travelling and tried to fill a refill prescription for mouthwash for himself and was refused. In Australia we are allowed to import up to two months supply of prescription medication without a prescription, as long as it’s not a drug with abuse potential (opiates, amphetamines). This works fine here, so it should work fine in America. “Or rather, the same references guides that doctors are trained to use in school, but neglect to consult in practice with real patients.” I can attest to this.